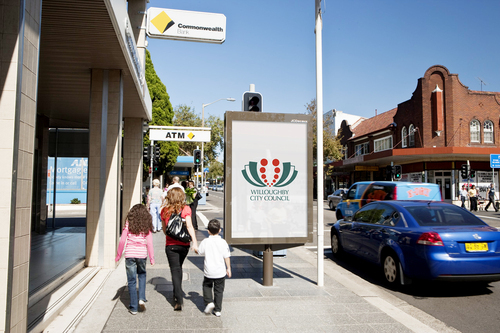 Council is considering the installation of freestanding advertising bollards in selected locations throughout the Willoughby Local Government Area (LGA). Approximately 20 locations have been identified for installation. Each location has been independently assessed and approved from a traffic and pedestrian safety perspective. In mid-2014, Council recorded within its Annual Financial Accounts an estimated cost of $38 Million to bring its infrastructure to a satisfactory level. Council is currently undertaking a service review which has identified potential recurrent savings from existing operations, as well as potential new and improved revenue streams, to assist in funding this amount and future infrastructure funding needs. All income derived from the installation of the advertising bollards will be directed to improving Council’s vast infrastructure network. This extensive proposal demeans us as a community. Extensive advertising exists throughout the City already – freestanding ones on the Mall, 12 individual moving bollards at the Railway Station and more. Nowhere in your community outline is mention made of the fact that these bollards involve distracting *moving* signage. Is this in fact the case? – as with recent changes to J C Decaux bus shelters? This imposes an enormous distracting impact on our enjoyment of our built environment. I am astonished that such an extensive program is being proposed. The Minister for Roads and Freight on behalf of the Department of Roads and Freight has written to me specifically stating that current regulations ban the installation of moving signs visible to drivers. These signs breach this regulation and I am currently pursuing State action in this regard. This Council’s online community consultation fails to state the fact that the signs may be animated. Even the JC Decaux photos and plans do not mention the possibility. It is this central issue of the moving nature of the signage which creates a serious safety hazard for drivers on these narrow lanes very busy roads. The intention is to catch attention of drivers. they do so – and so should not be permitted. The Council has a written policy of banning animated signage on shopfronts. Is it now to permit these even closer to a road edge? Some of the locations are bizarre – pedestrian traffic in Victoria Av such as Site 9 would seriously impede pedestrian traffic. Pedestrians will move around this bollard onto the road when confronting heavy traffic face on. Clr. Saville opines: I inspected the advertising bollards installed along Balmain Rd. Lilyfield, and found 2 advertising bollards between the Balmain Rd/Victoria Ave corner and Balmain Rd/Wetherill St., Leichardt. Please note that each of the bollards in the Balmain Lilyfield precinct is firmly placed against an already standing and substantial structure, such as a telephone booth.